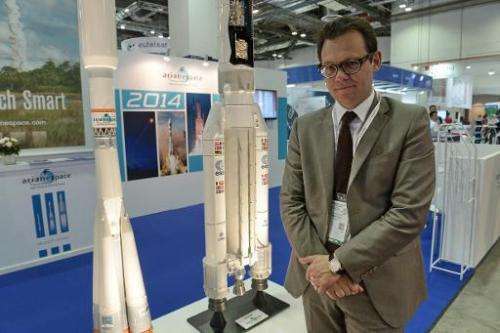 Europe's satellite launch industry needs to be overhauled to keep up with tough challenges from US rival SpaceX and other emerging competitors, the head of European satellite giant Arianespace has said. While the United States and Russia have led the way in space exploration, Europe's satellite launch programme Ariane has been at the forefront of the industry since Arianespace was founded in 1980. But Stephane Israel, chairman and chief executive of the France-based company, told AFP it's now time for a shape-up as new, fresher competitors come online. Speaking on the sidelines of the CommunicAsia trade show in Singapore on Tuesday, he said: "We have a newcomer in America with SpaceX. Yes, competition is increasing, but when competition is increasing, we need to be more and more agile." California-based SpaceX was founded in 2002 by US billionaire Elon Musk—the man behind Tesla electric cars—and made headlines in 2012 when it successfully launched an unmanned capsule to the International Space Station. The firm offers Falcon rockets that can lift commercial satellites into orbit for $60 million—half the cost if done with of the Ariane 5 rockets that are used to put into orbit satellites used for telecommunication, high definition TV broadcasts and Earth observation. The emergence of SpaceX and its challenge to Arianespace's dominance has been compared by observers to the competition triggered by low-fare airlines that jolted more established premium carriers. And the competition doesn't stop there, with Russia's Proton also in the wings, as well as firms from budding space-nations China, India and Japan, according to analysts. But Israel said: "We are the leader and the only question we should ask to ourselves is what should we do to remain the leader. "Europe is very serious about launchers, and Europe will not give up when it comes to launchers." Israel highlighted the news that Arianespace's two biggest shareholders, the Airbus Group and French engine maker Safran, had announced a joint venture in Paris on Monday. The 50-50 venture will produce rocket launchers for commercial satellites to better compete with SpaceX. "This is a significant move," Israel said in an interview. "It's a significant step. And I think it is the beginning of a refoundation of the launcher sector in Europe." "I think it's just the beginning of an ambitious movement to reshuffle the Ariane sector," Israel said. He added that said the venture would streamline Europe's rocket production process, improve decision-making and reduce costs. "Obviously, when you have less layers you have less costs," he said. While the current system is reliable, it is "too costly on the one end" and so cumbersome that "from time to time we lack some agility to react very quickly to competition". Currently, national space agencies in Europe design the launchers, which are given to the Airbus Group to be manufactured. Arianespace markets the end product to customers worldwide. Analysts said the Airbus Group-Safran joint venture would hopefully lead to the creation of a single entity that will handle the entire rocket manufacturing process. The company's shareholders include public and private interests across 10 European countries, including the French space agency CNES and Airbus. The European Space Agency will hold a ministerial-level meeting in December in Luxembourg to decide on the future of the Ariane 6 model, positioned as a low-cost answer to the Ariane 5 that it hopes to launch in 2021. Israel said Europe stood ready to defend its leadership in an industry where it currently accounts for half of all commercial satellite launches globally, and 64 percent in the Asia-Pacific region. "Things are changing and we need to prepare for the future. We need to have the rocket for the next decade and the decade after," Israel said.